July is a pretty good month for going mad around the festivals in Italy. Redentore Church Feast Day is on the third Sunday in July on Venice’s Giudecca Island. L’Ardia di San Costantino is a horse race around the Sanctuary of San Costantino in the central Sardinian town of Sedilo, July 5-7. A medieval festival is on the first week of July in Brisghella, medieval hill town and spa centre located in the Emilia-Romagna region, and if you are there go to Liguria coast and see Nostra Signora di Montallegro at the beginning of July in Rapallo. Festa del Cristo degli Abissi has a procession to the underwater statue of Christ in San Fruttuoso on the Ligurian coast, July 29. Molded from medals of mariners and athletes and parts of ships and bells, the statue is dedicated to those who lost their lives at sea. The first Saturday in July you can’t miss the Giostra della Quintana. 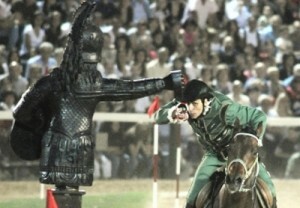 It is a famous joust held in Foligno (Umbria) also the second Sunday in September. Here above 600 participants will compete, all wearing traditional 17th century clothes. Several thousand people crowd the piazza! Festa della Madonna Bruna is celebrated July 2 in the Basilicata region, exactly in the city of Matera, a mesmerizing town with caves (the famous “Sassi”) really fampus for its atmosphere in southern Italy. A huge statue of the Madonna Bruna is paraded through town and….attacked! After being torn apart, the population burned it! And to top it all, you will assist to a spectacular fireworks display over the Sassi. U Fistinu of Saint Rosalia is one of Sicily‘s biggest festivals (July 10-15) in Palermo. The procession brings a 50-foot high float: inside a statue of Saint Rosalia and a musical band. Feast of Sant’Andrea the Apostle is well-known in Pescaraand it takes place the last Sunday in July: a huge parade of fishing boats off the coast welcomes the statue of the saint brought to la Marina di Pescara. This entry was posted on Saturday, July 7th, 2012 at 7:35 pm	and is filed under Events in Italy. You can follow any responses to this entry through the RSS 2.0 feed. You can leave a response, or trackback from your own site.